French whips and piano whips are used to stir stuff up and whip it in restaurant kitchens. These restaurant Whips are strong and durable for busy kitchens. Buy your wholesale piano whips at the restaurant supply superstore. 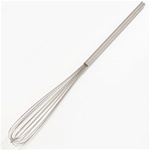 We stock mixing french whips from top manufacturers like Update International, Vollrath, and Carlisle. Vollrath Nylon Handle French Whips - 12 in. Vollrath Nylon Handle French Whips - 18 in. Vollrath Nylon Handle French Whips - 16 in. Vollrath Nylon Handle French Whips - 24 in. Vollrath Nylon Handle French Whips - 14 in. Vollrath Nylon Handle Piano Whips - 10 in. Vollrath Nylon Handle Piano Whips - 12 in. Vollrath Nylon Handle Piano Whips - 14 in. Vollrath Nylon Handle Piano Whips - 16 in. Vollrath Nylon Handle Piano Whips - 18 in. Update International Stainless Steel Kettle Whip - 48 in. Update International Piano Wire Whips - 12 in. Update International Piano Wire Whips - 16 in. Buy your wholesale restaurant whips from the leader in restaurant supply.